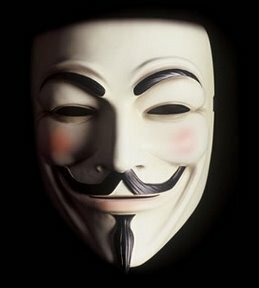 Today is Guy Fawkes Day. It celebrates the day a traitor to the King of England was thwarted in his attempt to blow up the entire government while it met upstairs. The plot developed as a way to end state-sanctioned religious persecution by killing James I and replacing him with a Roman Catholic monarch. Guy Fawkes, going by the name John Johnson, leased a cellar under the House of Lords in which to stockpile gunpowder. Most agree that an anonymous letter informed Parliament of the plan, while some theorize that the government knew of it already and allowed it go on, foiling it at the last moment to ensure massive outrage against the Catholic conspirators. In any case, Fawkes was found in the cellar with a pack of matches and 36 barrels of gunpowder. He was taken to the Tower of London and tortured. Twelve others were arrested for their involvement; four died in a shootout with English troops. The eight remaining men joined Fawkes in the Tower. In January 1606, they were all found guilty of high treason and condemned to death. 1. 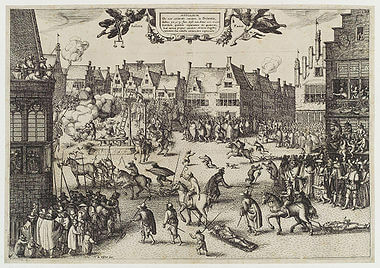 Dragged, usually by a horse, on a wooden frame to the place where he was to be publicly put to death. 2. Hanged by the neck until nearly dead. A short rope was used to prevent his neck from breaking and keep him alive. 3. Brought back to consciousness, if necessary, and placed on a table. His genitalia were removed and his intestines pulled through an incision made in his abdomen. During that time, pieces of his organs were burned nearby so he’d witness as much as possible in case he died before disembowelment was complete. 4. Decapitated and his body hacked into four parts. The head was usually par-boiled in brine to preserve its appearance, then exhibited in the Tower of London, while the quarters were covered in pitch to create a longer-lasting display. The king chose where to send them for optimal crime-deterring value. Fawkes jumped from the gallows platform and broke his neck. Though the executioners still carried out the rest of the sentence, they were robbed of the opportunity to do it to him while he was alive. While the capture of Guy Fawkes and failure of the Gunpowder Plot is still celebrated with bonfires and fireworks, it has less to do with 17th-century terrorism and more to do with throwing a party and having a good time. Lately, Fawkes’s image has been appropriated as a symbol of protest. In the 1982 graphic novel and its 2006 film adaptation, “V for Vendetta,” the hero is an anarchist who wears a Guy Fawkes mask while battling an authoritarian fascist state. The authors wanted to celebrate Fawkes by turning him into an anti-hero for the modern age. Plastic masks to commemorate the film’s release were given to fans. On February 10, 2008, Anonymous, a “hacktivist” group, held its first public demonstration against Scientology and its aggressive censorship. Protesters were urged to cover their faces to avoid identification “by hostiles.” Some took inspiration from the film’s final scene in which a crowd wore Fawkes masks while watching the Houses of Parliament explode and burn. Since then the mask has been used by the Occupy movement and by WikiLeaks founder Julian Assange. Many see the mask as an icon in the fight against tyranny. The Yeomen of the Guard would disagree. The English monarch’s bodyguards since 1485 still search the cellars below the Palace of Westminster before each state opening of Parliament. The spirit of Fawkes, for good or ill, lives on. 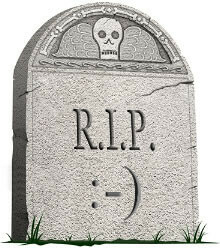 Depending on how you view it, a tombstone is your last chance to say goodbye, crack a joke, be profound or otherwise make cemetery visitors imagine you were cool and wish they’d known you before they move on to visit their Nana’s weed-covered grave. Plan Your Epitaph Day was created by Lance Hardie in 1995 to coincide with Day of the Dead (Dia de los Muertos), a Mexican holiday that honors the souls of departed loved ones. 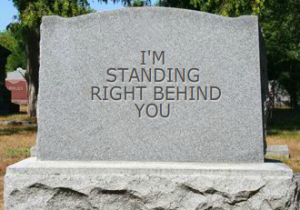 Hardie’s goal is simple: to make sure that we take control of our epitaphs, those few all-important words that will tell those who see them what we’d like them to think about who we used to be. Playing with the idea of death is encouraged at this time of year. We dress up for Halloween and laugh, perhaps a bit timorously, at shadows. It’s also a time for reflection and mental housekeeping, as we’ve seen with holidays recently profiled here: such as Create a Great Funeral Day, Visit a Cemetery Day, even National Magic Day with its tribute to the death of Harry Houdini. 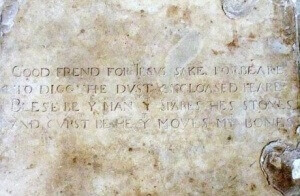 Let’s take a look at a couple of epitaphs quoted by Hardie. Fields was no fan of Philadelphia, famously calling it “a cemetery with lights.” When he was invited to contribute his own epitaph for the June 1925 issue of Vanity Fair, it was no surprise that Philly rated a mention. Since then, different permutations of the pithy comment coalesced into a myth regarding his gravestone. Sadly, Fields didn’t use his headstone to take one last jab for posterity. (Perhaps he worried the joke would not stay fresh through the ages or didn’t care since he wouldn’t be around to witness it?) Instead, it reads “W.C. 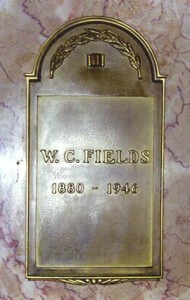 Fields 1880 – 1946”. Shakespeare didn’t leave a spooky epitaph to be studied and interpreted in perpetuity. He left instructions. In his day, it was accepted practice to dig up bones from the church’s graveyard and tombs, moving them to make room for more burials. They were placed in a charnel house and subsequently burned. Shakespeare knew and disdained Holy Trinity’s practice of recycling graves. He may have also meant to dissuade the government from moving his bones to Westminster Abbey. Thus far, his wishes have been honored. If the thought of penning your life’s final caption fills you with existential dread, Mr. Hardie is here to help. He will write it for you but won’t tell you how much it will cost you, just that it will be expensive. Let us take a moment to point out that many who die in prison have no means to pay for their funerals and end up in a prison graveyard like Captain Joe Byrd Cemetery in Texas, the largest in the country. They lie beneath markers that bear only name, inmate number and date of death. Notorious killers are routinely identified by inmate number alone, to discourage visitation and vandalism. Not much need for epitaphs there, free or otherwise. But enough of that. Let’s get back the fun stuff. Far be it from us to bring down the mood of such a happy occasion like planning our last words with some factual bummers. You’ll find funny epitaphs aplenty at MTWorld. Feel free to use it: no charge. It’s our gift to you. Everybody knows today is Halloween. But it’s also National Magic Day, when members of the Society of American Magicians (SAM) and many other groups celebrate with free magic performances for kids, the ill, elderly and shut-ins. Why is this holiday celebrated today? In 1938, a Chicago member of SAM proposed a holiday to honor Harry Houdini. 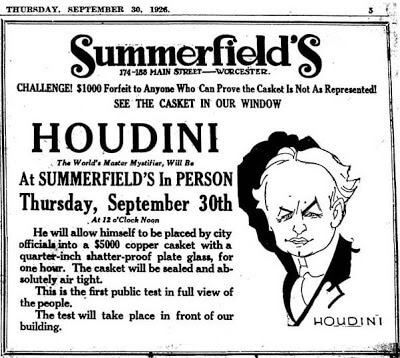 October 31st was declared National Magic Day in memory of the day Houdini died. Houdini set the standard for a type of performance known as Escape Or Die. There are at least three possible ways for a magician to risk his life in the event of failure. These are death by drowning, as in the water escapes Houdini pioneered; death by suffocation, as in escapes from airtight enclosures such as coffins; and death by falling (also originated by Houdini), in a straitjacket escape while hanging from high above the earth, where falling meant certain death. 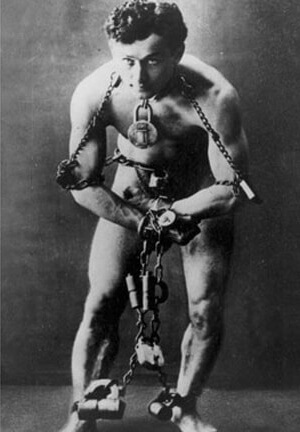 In 1915, at the Panama-Pacific International Exposition in San Francisco, Houdini was chained in a locked box weighted down with 500 pounds of iron and dropped into the bay. He escaped. To celebrate the fair’s centennial, the Palace of Fine Arts, the only building that remains from the exposition, has constructed an “escape room” which challenges all who enter to escape within 80 minutes. The test went off without a hitch. What no one knew then was that it would become Houdini’s casket only one month later, after his death on Halloween 1926. Houdini wasn’t killed by a feat gone wrong; he died of diffuse peritonitis due to acute appendicitis, widely believed to have been caused by a punch to his abdomen on the morning of October 22, 1926. A young man who may have been a college student, an amateur boxer or both decided to test Houdini’s boast that he could withstand any blow. The magician later claimed he was injured only because he wasn’t given time to prepare by tensing his abdominal muscles. Research shows it’s unlikely that a punch could directly rupture an appendix, even one that’s already inflamed. In any case, Houdini mistakenly assumed the pain he suffered afterward was due only to the punch, leading him to refuse medical treatment for what could have been a routine case of appendicitis. Instead, he continued to perform for two more days until, overwhelmed by pain, he agreed to be hospitalized. The surgeon who removed his appendix found it had burst, spreading peritonitis throughout Houdini’s body. The odds were against him in the days before antibiotics, but he held on and endured another surgery, seeming to rally before finally slipping away on October 31st at the age of 52. Since the failure of the ten-year test, it is my opinion that all concerned have struck a mighty worldwide blow at superstition. She couldn’t have been more wrong. The “final” séance spawned dozens of Halloween Houdini séances that continue to this day. Some bill themselves as “official.” As Houdini himself would tell you, that’s impossible. One thing’s for sure: If séances work, then Mr. Houdini’s phone is ringing off the hook right about now. So it seems a bit odd that he befriended Arthur Conan Doyle, who was a fervent believer in psychic phenomena. Each sought to convert the other until Doyle’s wife Jean offered to contact Houdini’s mother shortly after her death. He agreed, wanting to believe it was possible. During the séance, Jean went into a trance while holding a pencil and jotted a message from Houdini’s mother through a method known as “automatic writing.” Houdini took the note, saying nothing about the fact that his mother had never learned to read or write and, in any case, spoke no English. He went public soon after, saying that he didn’t believe the Doyles were being intentionally deceitful. They were simply gullible. Doyle responded by saying the language of the spirit is universal. Their friendship never recovered. Read more about Houdini’s amazing exploits. Honor his skepticism of mediums and con artists, while experiencing the childlike wonder of a magic show. Have a happy National Magic Day! So says Gail Rubin, a death services planner, radio host and leader of the Albuquerque chapter of Death Café. She’s been called the Doyenne of Death and liked it so much, she trademarked it. She runs a site called A Good Goodbye – Funeral Planning for Those Who Don’t Plan to Die. Countless movies and television shows have poked fun at the stress of eulogizing a complete stranger, but how much do we know about our loved ones? Enough to plan the party after they’re gone? This holiday was originated by Stephanie West Allen in 2000 after her mother-in-law died, leaving no instructions for her funeral. Watching her husband struggle to create a meaningful service inspired Allen to write Creating Your Own Funeral or Memorial Service: A Workbook to encourage people to pre-plan their funerals and spare their families that stress. This book is invaluable in addressing the amount of work involved in organizing a funeral. Many people are unaware of the processes required, including collection, transfer, preparation, choice of cremation or burial, plot, niche or home storage and which type of urn goes with your decor. Another, more playful planning tool is Go Wish, a card game developed as a fun way to start a conversation and clarify the end-of-life wishes of the targeted family member. If a relative shows up with this card game, he might know more than you do about your latest MRI results. And he might have his eye on your collection of mint-condition Life magazines. The Go Wish game is a set of 36 cards and can be played by several people or in “solitaire” mode, which just sounds like the saddest thing ever. Each card has a short statement that the individual (let’s just call him the goner) will rank in order of priority of what’s most important to him in his last weeks or months of life. He can then explain to a possibly imaginary friend or family member why he sorted it the way he did. The game’s maker, Coda Alliance, has tested the game in hospitals, nursing homes, community meetings and elsewhere. A researcher stated, “In one large group, where I emphasized that we did need to collect the packs for re-use, there was nonetheless a 30% attrition rate – a testament to this being a desirable commodity.” Or maybe nursing homes are a breeding ground for degenerate thieves. Boomers: Is the International Cemetery, Cremation and Funeral Association (ICCFA) pandering to you when its site sports a YouTube link to Blue Öyster Cult’s 1976 song, Don’t Fear the Reaper? Per ICCFA, the song’s message is that love endures beyond the grave despite the best efforts of the Grim Reaper, a personification of death from European folklore. We thought it was just about getting stoned. It isn’t surprising to learn that 38% of so-called Millennials and 32% of Gen-Xers have tattoos. But you may not have realized that increasing numbers of older people are getting inked, too. A Pew Research study determined that roughly 15% of Baby Boomers (those born between 1946 and 1964) have at least one tattoo. So what happens to that tattoo when you die? Good news: you don’t have to take it with you! When you join the National Association for the Preservation of Skin Art (NAPSA), you’ll have peace of mind knowing your tattoo will be harvested from your body within sixty hours of your death and treated with a proprietary blend of chemicals which halts decomposition. 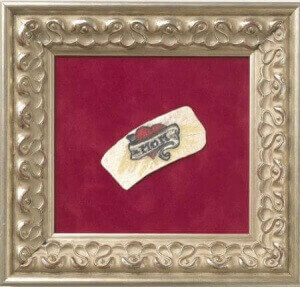 Yes, this is a real tattoo – frame not included. According to NAPSA, this preservation process permanently alters the human canvas, or “raw art.” Then the finished piece, which is technically no longer skin and therefore not creepy at all, will be shipped to your lucky loved one. They won’t frame it for you, though. Good luck getting that mounted at your local frame shop. If you’d like someone special to leave his or her tats to you after passing but don’t know how to broach the subject of postmortem hide removal, say it with a NAPSA gift certificate. No faces or genitalia, though. They have standards. Don’t wait another day to create a great funeral for yourself. Remember, if you build it, they will come. (Have we mentioned paid mourners? Can’t hurt!) Now get out there and have fun!